Don't let this stop you from calling or texting us at 707.362.9856 to arrange an alternate day/time to meet! Saturday, May 2nd, 2015 was our Grand Opening and we instantly became the only dedicated dive shop between Crescent City and Fort Bragg! We are open Wednesday evenings from 6 pm to 8 pm and Saturdays from 10 am to 5 pm. Don't let that stop you from calling us at 707.362.9856 to arrange an alternate day/time to meet! 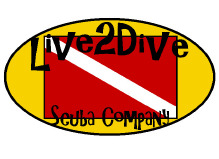 To find Live2Dive Scuba Company, take Samoa Blvd/CA Highway 255 South past the town of Samoa and past the old pulp mill. Just past the old Pulp Mill is the Fairhaven Power Plant which is on the corner of Hwy 255 and Bay Street. Turn left on Bay Street and continue East until you have no other option but to veer right! Once you have made the turn to the right (your only option) you are now on Fay Street! Half way down the street Fay goes from paved road to dirt road. The last property on your left is the Zerlang Boat Yard and that is where we are located. Pull through the gate, turn right immediately inside the fence and you will see our store on your left.